The need to relaunch once again the institutional activities in the capital of the region of Litoral, after some years in which the capital was only in Malabo, is the main reason that the President and the Government have established once again that the Executive Branch remain in Bata. 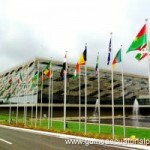 For this reason alone, the Head of State met with the Ministers of the different branches, on Friday, February 7, in a special Government Council, which had the only topic of establishing the appropriate guidelines for the transfer of all the Government to Bata. On October 30, 2013, the Presidential Decree number 161/2013 was issued, appointing the Secretary-Generals of the various ministerial departments of the Central State Administration. We publish these appointments below. Decree Number 161/2013, dated October 30, appoints the Secretaries-General of the various Ministerial Departments of the Central State Administration. 1. Secretary-General of the Ministry of Foreign Affairs and Cooperation: SANTIAGO BIVINI MANGUE. 2. Secretary-General of the Ministry of Justice, Religious Affairs and Penitentiary Institutions: MARIA DEL CARMEN MBEZE NGUEMA. 3. Secretary-General of the Ministry of National Defense: ALFREDO ABESO NVONO ONGUENE. 4. Secretary-General of the Ministry of Internal Affairs and Local Corporations: VICTORIANO ENGONGA ONDO KEA. 5. Secretary-General of the Ministry of National Security: AQUILINA MANGUE EVUNA ANDEME. 6. Secretary-General of the Ministry of Economy, Planning and Public Investments: GENARO ELA KUNG. 7. Secretary-General of the Ministry of Commerce and Business Promotion: FRANCISCO MEDINA CATALAN. 8. Secretary-General of the Ministry of Finance and Budgets: MARCELO BETA ECHUACA. 9. Secretary-General of the Ministry of Transportation, Technology, Postal Services and Telecommunications: RAMON NONATO OBAMA ÑENGONO. 10. Secretary-General of the Ministry of Education and Science: PEDRO ESONO NSE. 11. Secretary-General of the Ministry of Health and Social Welfare: LUIS NGUEMA ONA BINDANG. 12. Secretary-General of the Ministry of Public Works and Infrastructures: MIGUEL-ANGEL JORA BABO. 13. Secretary-General of the Ministry of Labor and Social Security: MONTSERRAT NBONKANKA TABARES. 14. Secretary-General of the Ministry of Agriculture and Forestry: SANTIAGO NSENG MANGUE MEKEMESA. 15. Secretary-General of the Ministry of Mining, Industry and Energy: VICENTE ABESO MBUY. 16. Secretary-General of the Ministry of Information, Press and Radio: MANUEL NDONG BIBANG NGUY. 17. Secretary-General of the Ministry for Social Affairs and Gender Equality: BENEDICTO NSI IYANGA. 18. Secretary-General of the Ministry of Fisheries and the Environment: PAULINO NGUEMA MEBAHA. 19. Secretary-General of the Ministry of Public Administration and Administrative Reform: JESUS MIKO NGUEMA. 20. Secretary-General of the Ministry of Youth and Sports: JOSE-RAMON OBAMA SIMA. 21. Secretary-General of the Department of Culture and Tourism: UBALDO-MARCOS NGUERE ALOGO. 22. Secretary-General of the Department of Civil Aviation: LEANDRO NGUEMA MBA. I hereby order this by this decree, given in Malabo, on October 30, 2013. 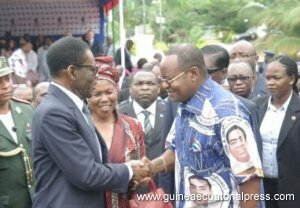 Constancia Mangue de Obiang met in an audience with the new Secretary General of the Democratic Party of Equatorial Guinea (PDGE). This first official meeting between the First Lady and the recently appointed new Secretary of the Party was held on Monday, October 28 at the residence of the Head of State. The head of the National Office, Jeronimo Osa Osa Ecoro, came to speak to the First Lady in her capacity as Honorary President of the Women’s Organization of the PDGE. 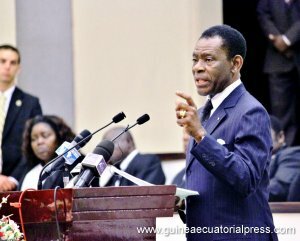 The meeting provided a framework for the new Secretary-General to request the guidance of Constancia Mangue de Obiang in order to carry out the great responsibility that President Obiang Nguema Mbasogo has entrusted him with. Jeronimo Osa Osa Ecoro was appointed new Secretary-General of the PDGE on October 4. NEW YORK — Bilateral and multilateral diplomacy are on the agenda. 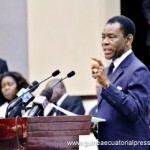 PRNewswire-USNewswire/ — Equatorial Guinea’s President Obiang Nguema Mbasogo will address the United Nations General Assembly (UNGA) on September 26. 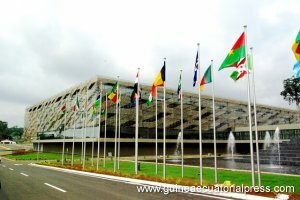 President Obiang has a full schedule of other events his week, including several meetings with other heads of government and heads of state. On Friday, September 20, the opening of the First Ordinary Session of the Chamber of Deputies took place, which was chaired by H.E. Obiang Nguema Mbasogo. This ceremony, coordinated by the Director General of Protocol of the legislative body, Victor Esono Nsue Mbang, began with the oath of office before the Head of State of the substitute deputies, who because of the promotion of the office holders who moved on to higher responsibilities or because of death, occupy those vacant seats to avoid incompatibility. Therefore, Juan-Rocu Enumbie was sworn in as second member and Francisco Asumu Bikuy as first secretary of the table of the Chamber of Deputies. Gabriel Orobiyi Bankole and David Nguema Mañana replace Evangelina-Filomena Oyo Ebule, current Minister of Justice, Religious Affairs and Penitentiary Institutions, and Francisco Mba Olo Bahamonde, Minister of Transportation, Technology, Postal Services and Telecommunications, in the constituency of Malabo; Maria-Leonor Bula Epam Beribe for the constituency of Baney; Ernesto Aurelio Etadji Ehome and Benjamin Mitogo Bielo for the constituency of Luba; Genoveva Nchama Nguema for the constituency of Bata: Maria Consuelo Nguema Oyana for the constituency of Mbini; Nuria Lucia Beholi Epesi for the constituency of Cogo; Bartolome Ndong Abeso for the constituency of Mongomo; Bienvenido Beyeme Nsue for the constituency of Anisok; Jaime Ela Ndong for the constituency of Akonibe; Natividad Ondo Bibang for the constituency of Ebebiyin; Wenceslao Nzamio Enguang and Jesus Oyono Meina for the constituency of Micomeseng, and Juliana Mangue Esimi for the constituency of Nsok-Nzomo. Before the personalities who make up the country’s official institutions, the Vice Presidents of the Republic, one for Presidential Affairs, Ignacio Milam Tang, and the other for National Defense and State Security, Teodoro Nguema Obiang Mangue, Presidents of other Constitutional bodies, Government and diplomatic corps, the Head of State presented the opening speech of these sessions by congratulating all of the components of the legislative body for the trust that the people of Equatorial Guinea have placed in them. 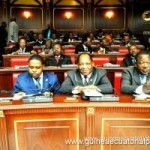 Yesterday, Monday, the Presidency of the Republic published the decrees appointing the Prime Minister of Government to Vicente Ehate Tomi and Deputy Prime Ministers to Clemente Engonga Nguema Onguene, Lucas Nguema Esono and Alfonso Nsue Mokuy. Vicente Ehate Tomi, Prime Minister of the Government for Administrative Coordination, was confirmed in his position, according to Decree number 119. 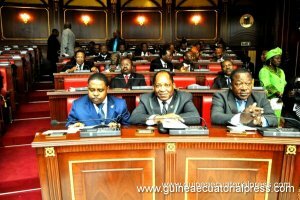 Clemente Engonga Nguema Onguene continues as First Deputy Prime Minister for the Political Sector, Democracy and Minister of Internal Affairs and Local Corporations, Lucas Nguema Esono, Secretary General of the Democratic Party of Equatorial Guinea (PDGE), goes on to be the Second Deputy Prime Minister for Social Affairs and Minister of Education and Science, according to decrees number 120 and 121. 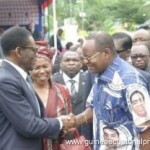 Finally, Alfonso Nsue Mokuy was appointed Third Deputy Prime Minister for Human Rights, according to decree number 122. In the upcoming days, the swearing in of offices will take place before the President of the Republic, H.E. Obiang Nguema Mbasogo. Here is the complete list, in alphabetical order, of the Senators and Deputies of the new bicameral Parliament, which was inaugurated by the President of the Republic, H.E. 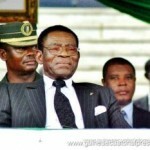 Obiang Nguema Mbasogo on July 12. The Senate has 75 Senators, instead of 74, since Angel Serafin Seriche Dougan, former President of Parliament, was appointed, as provided in the Constitution, Senator by right; and the Chamber of Deputies with 99, since Seriche Dougan became senator, his position is now vacant, waiting to be covered by substitute from the same constituency of the PDGE. We must remember that this year, for the first time, begins the operation of the Higher Chamber or the Chamber of the Senate, after the reform of the Basic Law. 1. AGUSTIN NDONG ONA MBUY, 2. AGUSTIN NSE NFUMU, 3. ALEJANDRO ENVORO OVONO, 4. ALFONSO NSUE MOKUY, 5. ANASTASIO ASUMU MUM MUÑOZ, 6. ANATOLlO NDONG MBA, 7. ANGEL ESONO ABAHA MANGUE, 8. ANGEL MESIE MIBUY, 9. ANGEL NDONG ESONO EYANGA, 10. ANGEL SERAFIN SERICHE DOUGAN MALABO, 11. ANICETO EBIAKA MOHETE, 12. ANSELMO ONDO ESONO ASANGONO, 13. ANTONIO JAVIER NGUEMA NCHAMA, 14. ANTONIO PASCUAL OKO EBOBO, 15. ATANASIO ELA NTUGU NSA, 16. BASILlO EDU NGUEMA NZANG, 17. BATHO OBAM NSUE MENGUE, 18. BERNARDINO EDU OBA, 19. BUENAVENTURA MOSWI M’ASUMU, 20. CARMELO MOKONG ONGUENE, 21. DEMETRIO ELO NDONG NSEFUMU, 22. DOMINGO MITUY EDJANG, 23. ELlAS ONDO EDJO, 24. ELlAS OVONO NGUEMA, 25. EUCARIO BAKALE ANGÜE, 26. EULALlA ENVO BELA, 27. FIDEL MARCOS MEÑE NKOGO EYANG, 28. FLORENCIO MAYE ELA, 29. FORTUNATO NZAMBI MACHINDE, 30. FORTUNATO OFA MBO, 31. FRANCISCO MABALE NSENG, 32. FRANCISCO MASA BELOPE, 33. GUILLERMINA MOKUY MBA, 34. HERIBERTO MEKO MBENGONO, 35. HILARIO KOMBA DIVANI, 36. IGNACIO MILAM TANG, 37. JACINTA MBANG NGUEMA, 38. JOSE ANTONIO ELOMBA VIÑAS, 39. JUAN ANTONIO BIBANG NCHUCHUMA, 40. LEOCADIO NDONG MONUMU, 41. LUCAS NGUEMA ESONO MBANG, 42. MANUEL SAÑABA SILOCHI, 43. MARCELlNO NGUEMA ONGUENE, 44. MARCELlNO OYONO NTUTUMU, 45. MARIA NCHAMA BAYEME, 46. MARIA NIEVES EKORO NSANG, 47. MARTIN CRISANTOS EBEE MBA, 48. MARTIN ELA ONDO, 49. MAXIMO MICO ONDO. 50. MELCHOR ESONO EDJO, 51. METODIO SEHE NSI BINDANG, 52. MIGUEL MBA NZANG, 53. PASCUAL ONDO MASA, 54. PEDRO ONDO NGUEMA OKOMO, 55. PILAR DJOMBE DJANGANI, 56. POLlCARPO MONSUY MBA, 57. PURIFICACION BOHARI LASAGUERO, 58. RICARDO MAXIMO TORAO OYO, 59. ROSENDO ELA NSUE MIBUY, 60. SALOMON NGUEMA OWONO, 61. SALVADOR ELA NSENG, 62. SANTIAGO HINESTROSA BEHOLl, 63. SANTIAGO OBAMA NDONG. 64. SANTIAGO ONDO NTUGU ANGUESOMO, 65. SATURNINO OKE ESONO BINDANG, 66. SILVESTRE SIALE BILEKA, 67. TEODOMIRO NZE MANGUE, 68. 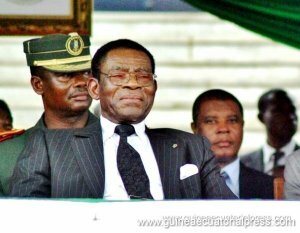 TEODORO NGUEMA OBIANG MANGUE, 69. TERESA AVORO NGUEMA, 70. TERESA EFUA ASANGONO, 71. TOMAS MECHEBA FERNANDEZ GALlLEA, 72. VICENTE EHATE TOMI, 73. VICENTE RODRIGUEZ SIOSA, 74. VICTORIANA NCHAMA NSUE OKOMO, 75. VIDAL CHONI BECOBA. For two days, the new senators and deputies have carried out the accreditation process in the House of People’s Representatives. The oath they all take will be carried out in the presence of the President of the nation, in a solemn public ceremony to be held in Sipopo next Friday, July 12.